"Girls account for 71% of new HIV infections in Sub-Saharan Africa"
Giles, Elizabeth, August 19, 2015. Elizabeth's paper on her research presented at the 2015 IFLA conference in Cape Town, South Africa for the "Dynamic African Libraries for Young People: showcasing best practices to inspire us all" session. Meyers, Jane Kinney, August 16, 2015. Jane's paper on partnerships presented at the 2015 IFLA conference in Cape Town, South Africa for the "Dynamic partnerships for access development and transformation in libraries for young people" session. University of Illinois, April 9, 2015. A profile on Kasonde Mukonde is featured on the Department of Library and Information Science homepage. Kupryte, Rima, April 14, 2015. "How public libraries can help 120 million illiterate young people." EIFL Newsletter. 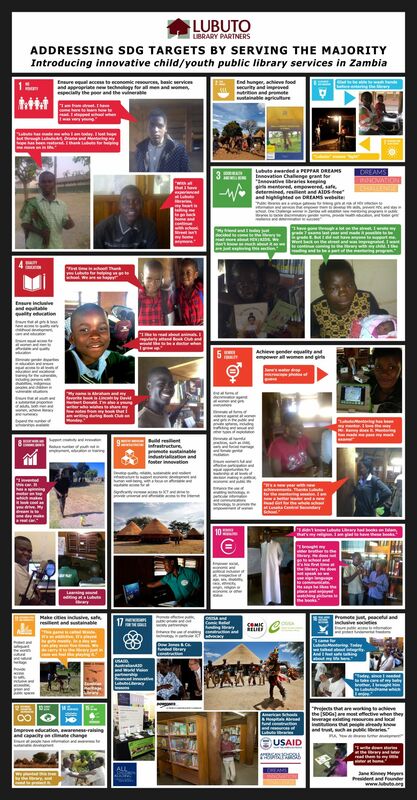 The new LubutoLiteracy lessons were featured in EIFL's April 2015 newsletter along with a picture of Lubuto children. USAID/ASHA Fiscal Year 2013 and 2014 Report A photo of a Lubuto storytelling session is on the inside cover of the report. "Library’s literacy lessons to be distributed across Zambia." EIFL Public Library Innovation Programme, February 17, 2015. "Library’s literacy lessons to be distributed across Zambia." Read entire feature. "Lubuto Library Partners: Serving Vulnerable Children in Africa,"
Bergman, Elaine Lasda "Lubuto Library Partners: Serving Vulnerable Children in Africa," INFORMATIONSPACE, 19 January 2015. Jane Meyers is interviewed for the official blog of Syracuse University's School of Information Studies. "Lubuto Library Partners awarded USAID/ASHA grant to build 4th library in Zambia." Press release, January 15, 2015. "Lubuto Library Partners awarded USAID/ASHA grant to build 4th library in Zambia." Read entire release.